Callander to Balquhidder Walk, River Teith, Callander. The current trend of 'bagging' Munros has occasioned the effect of diverting some hillwalkers away from many other fine hills which fail to match up to the minimum height of 3,000ft/914m, but the two Corbetts - hills over 2,500 ft/700m with ascents of at least 500ft/150m on every side - included in this route offer an exceptionally challenging day's walking. The traverse of this fine mountain route, much used in the now distant days of the clans, offers magnificent views of the innumerable lochs and hills of the Southern Highlands. 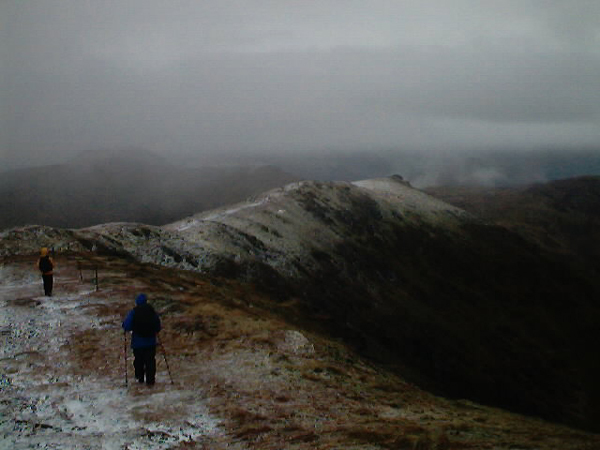 It is by no means an easy walk and anyone contemplating it must ensure that they have the proper footwear, clothing and navigational equipment. It is best to arrange to have transport at both ends, though a local bus service is available on certain weekdays. If leaving a car at Balquhidder, parking is permitted in the grounds of the village hall beside the telephone kiosk on a donation basis. Drop a donation in the hall letterbox! Start from The Meadows Car Park beside the River Teith in Callander, situated off the main street opposite the Dreadnought Hotel. Make sure that a parking ticket is purchased and displayed on the car before setting out then follow the cycle track, established along the line of the former railway for the first 2.75 miles. Ahead, Ben Ledi tends to dominate the first part of this walk. It is thought that the long southeast slope of the mountain, which runs down to Loch Venachar, perhaps gave it its name of Beinn an Leothaid - 'the mountain of the gentle slope' - although Beinn le Dia - 'the mountain of god' - is more likely. Like Ben Nevis, local people refer to it as 'the Ben'. Follow the track as it crosses the A821 near Kilmahog, through the Pass of Leny with views of the tumbling River Leny on the right, into the Forestry Commission Stank car park at the beginning of the Ben Ledi ascent route. Follow the well defined, if somewhat rough, forest path steeply up through the trees. Above the tree line, cross the fence and continue gradually uphill over some boggy ground, keeping the steep sides of the hill on the right (north). A scramble up the prominent shale score is not recommended, as the ground is far less stable than it appears. The intermittent track heads uphill and southwards before swinging sharp right (west) and then north to gain the crest of the long, grassy southeast ridge. Stay on the undulating ridge over varied terrain to reach the summit trig point(2,884ft/879m). There is a prominent iron cross here, erected to commemorate a member of the Killin Mountain Rescue Team, killed in a helicopter crash on nearby Ben More. 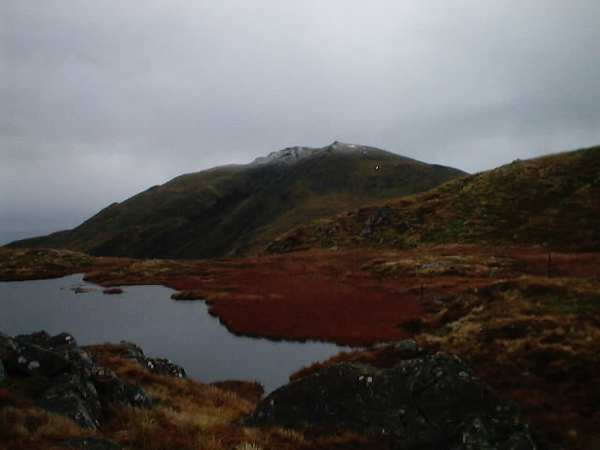 The mountain summit is connected with La Buidhe Bealltuinn - 'the yellow day of the fires of bel'. In bygone days, on May 1 - the old Celtic New Year - young people from the parishes of Aberfoyle, Balquhidder, Buchanan and Callander met here to commemorate the ancient Druid rite, the lighting of the Bealltuinn (Beltane) fires. Hearth fires in the houses were cleared before midnight and new ones lit in the morning from the embers of the sacrificial ones lit on the hill. Follow the easy northern ridge of Ben Ledi away from its summit down to broken ground above Stank Glen (from the Gaelic stang, pools), on past Lochan nan Corp 'the small loch of the dead', then swing north west to Stuc Dubh 'black peak'. The name 'Lochan nan Corp' is believed to have originated following the loss of a funeral party which was heading over the route for a burial ground by Loch Lubnaig in a winter storm. They crossed the snow-covered ice which subsequently broke and all were drowned. The route continues over undulating ground, now following a rusty line of fence posts, until reaching the lower, eastern slope of Ben Vane and, eventually, its summit cairn (2,685ft/818m). Do not be tempted to stray from the relative security of the fence posts, even though the path appears to bear away from it at times to bypass boggy ground. It is a very good navigational aid in adverse weather conditions. Stay on the northward ridge to the end of the line of fence posts, then descend ahead on the narrow, intermittent track into Glen Buckie meeting the right of way from Brig o' Turk to Balquhidder. Go out through the gate in the high stone wall near the farm at Balliemore, from where there is a tarmac road to the finish. Stay on the road for some 2 miles/3.2km to a junction just before the bridge that crosses the Balvaig River. Bear left here and continue past the eastern end of Loch Voil to Kirkton of Balquhidder, 'the township of the back country', where there are historic churches dating from 1631 and the graves of Rob Roy MacGregor - the famed cattle dealer and warrior - his wife Mary (Helen) and two sons Coll and Robert. The present church of 1855 is worth a visit. Maps OS Landranger sheets 57, OS Explorer sheet 365. Start/parking Car Park at The Meadows, Callander. GR: NN 625079. Finish Balquhidder Village Hall. GR: NN 534207. Grading A scenic, if demanding traverse that includes two Corbetts - Ben Ledi and Ben Vane - over a mix of cycle track, rough and sometimes quite steep terrain and some road walking to finish. 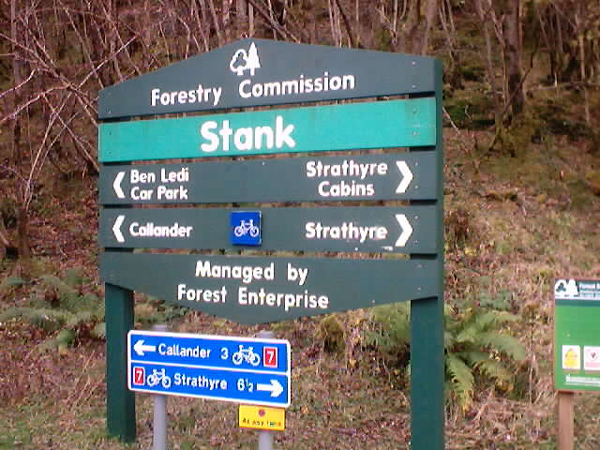 It is recommended for fit hillwalkers only. Mini bus hire Addison's, Tel 01877 330969.